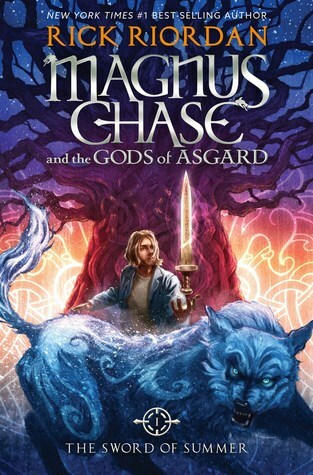 If you've read any of Rick Riordan's books for young readers, you've pretty much already read Magnus Chase and the Gods of Asgard: The Sword of Summer. It's funny, exciting, and comfortingly familiar—but it's a little stale, too. There has been a lot of weirdness in Magnus Chase's life, but when his long-lost uncle informs him that he is actually the son of a Norse god, Magnus (understandably) refuses to believe him. Unfortunately, it's hard to argue with the various monsters from Norse myth that keep popping out of the woodwork. They want something from him, and he's not exactly prepared to defend himself. Riordan's books always slide right down. They're full of humor and adventure, and he has a gift for creating engaging protagonists, even when their many talents (they're always clever, good-looking, athletic, and shockingly lucky) could easily shift them into Mary Sue territory. I enjoyed every page of Magnus Chase, just like I enjoyed all of Riordan's previous YA books, but he's reminding me more and more of Meg Cabot: a charming writer who sticks with what's easy.